Willy Wonka and the Chocolate Factory: Yep, still pretty good. Mel Stuart’s 1971 musical adaptation of the Roald Dahl classic gets the Warner Bros. 1080p Blu-ray box set treatment for it’s 40th Anniversary. For a full review of the DVD/Blu-ray set, hit the jump. 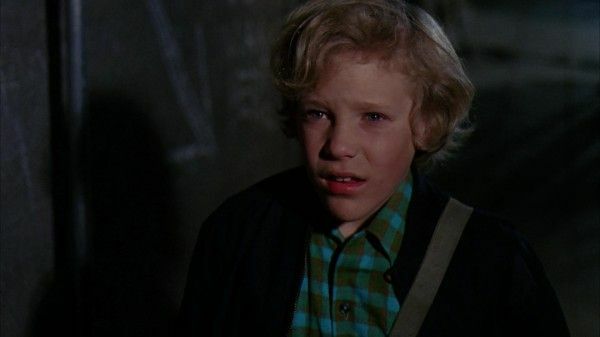 Obligatory Plot Synopsis: The well-heard tale of a poor boy (Peter Ostrum) living in the slums with his ma and grandparents, dreaming of making it big and discovering one of five gold tickets to the factory of an enigmatic chocolate entrepreneur – the eponymous Wonka. As this is a feature and not the most depressing twenty-minute short of all time, the young lad finds the ticket and journeys to the mysterious Wonka factory alongside four of the nastiest youngsters ever conceived. What follows is sort of like the children’s version of Agatha Christie’s And Then There Were None as each of the snot-nosed kids get their due in increasingly outlandish ways. A parable of the common man (or in this case – boy) rising above his poverty-stricken conditions and the greedy/gluttonous/privileged “1%” by just being good and wholesome. It’s hard not to be what’s-the-word… heart warmed by the whole ordeal. Revisiting the film X number of years later and for the first time on Blu-ray, the color schematic of the film really does pop. Charlie’s bright red sweater/scarf stands out in stark contrast to the subdued blues of the Bucket household. 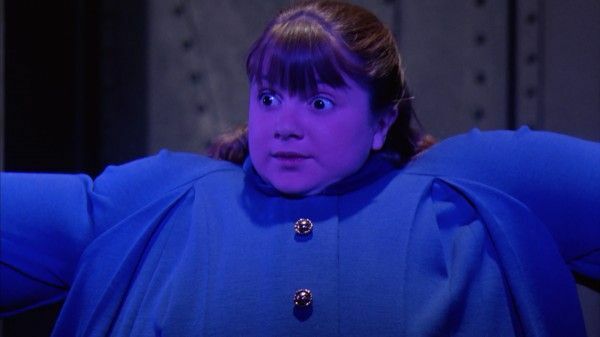 When the film gets to Wonka’s factory*, colors become notably more lucid – Wonka’s PURPPLE wardrobe, the garishly YELLOW/GREEN Oompa Loompa’s faces, the GOLD eggs – whereas oddly enough Charlie’s attire becomes a subdued blue. This can perhaps be thought as reflective of the aforementioned odd structure of the picture, wherein for the first half Charlie Bucket is for all purposes the lead/hero/protagonist but once the boy steps foot in Wonka’s factory, he becomes little more than a glorified extra standing passively as Wonka says crazy gibberish and all the kids start dropping. From the second Wonka limps with cane outside his factory, the film changes from a Horatio Alger story to the weird tale of a lonely eccentric man searching in vain for a companion. Paragraphs could be dedicated to just how good Gene Wilder and Jack Albertson (Grandpa Joe) are. Or how good the young cast is (Is it wrong that I kind of root for Veruca Salt in the flick?). Or the score and musical numbers by Anthony Newlie & Leslie Bricusse. Enough (deserved) praise has been given out to “Pure Imagination” or Sammy Davis’s “Candy Man,” but for me the true standout song will always be “Cheer Up Charlie.” “Just be glad you’re you” gets me every time. The Blu-ray picture is presented 1080p/1.78:1 – and as previously mentioned the image really does look clear and precise – although sometimes to its own detriment. The green-screen work hasn’t aged particularly well and the preciseness of the image does it no favors — in particular the Mike Teevee transferring himself to the small screen bit and the climax/flying elevator stuff all looks a bit shoddy to the modern eye. I’m still not quite sold on the chocolate rainfall/river. Everybody reacts like it’s the most beautiful/amazing/stupefying wonder in the world – but to me, it just looks like a muddy, dirty, contaminated New Jersey river especially in 1080p. The sound work (in Dolby 5.1) seemed particularly clear on my speakers, with the lyrics to the musical numbers very easy to follow. 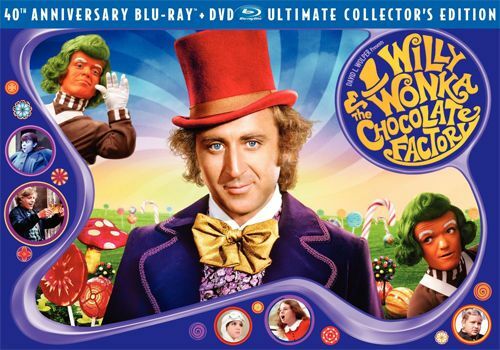 The film is presented with a number of special features, most of which are holdovers from the 2001 release: a commentary track with the cast of children now all grown up, sing-along Wonka songs, a documentary on the making of the film, a photo gallery and trailer. Two new featuretes are included with the box set: a more recent interview with director Mel Stuart, which pretty much just reiterates stuff he said in the previous making-of documentary and a more interesting 1971 behind-the-scenes puff piece, which features an all too brief interview with Roald Dahl (but hey, I’ll take what I can get). The box set also comes with a book on the making of the film, production notes/letters and a tin can with pencils and a chocolate-scented eraser. All in all – a fairly comprehensive collection for the so inclined Wonka faithful out there. *Which by the by, happens much later than I had remembered. 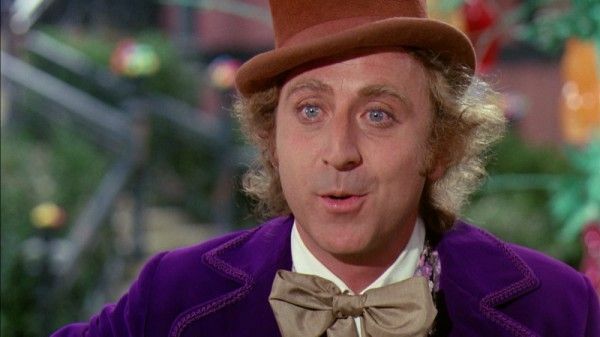 My impression was that Wilder/Wonka’s introduction happened at the end of the first act – but in reality he doesn’t enter the film until the midpoint: about 50 or so minutes into the 100 minute run time.